With rising energy prices, air and water pollution and increasing awareness of human impacts on the global environment, many people are interested in clean, safe, and environmentally friendly heating options for their homes. BIOFLAME is a Bioethanol fireplace that brings together form and function to create a smokeless and ventless fireplace that can be easily matched with you interior design. Unlike other eco-friendly fireplaces, Bioflame is a high-tech clean burning fireplace created to run on a highly refined ethanol which is nonstop fed into the fire. The Bioflame vent free sets allows you to be eco friendly while saving money on your energy bill. Can you hang a painting? 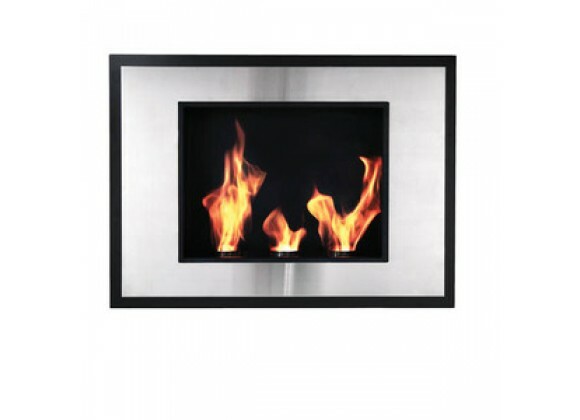 Because that's how easy it is to mount a Bio Flame wall mounting fireplace. You can also have the option of placing this in the wall. Make a clean flush wall inserted fireplace for a more contemporary look. Vent less and odor less. Eco-Friendly Bio Fuel Wall Mount And Recessed Insert Fireplace. Recessed Insert Fireplace Recesses 6 /12î Into Wall - Protruded Just Over An Inch. 3 Stainless Steel Fuel Cans Hold 15oz Of Bio Fuel Each - 2 Hours Of Burn Time. No Permanent Or Expensive Connections - No Requirement For Chimneys, Venting Or Flues. 4,000 BTUs Per Fuel Can; Flame 12î High. Bio Fuel Is Derived From Common Crops Such As Sugar Cane And Corn And Releases No Harmful Gases Or Smoke When Burning, Only Natural Heat.